We are now at the end of two days of field work in southern-most Spain, and our count of migrants crossing the Strait of Gibraltar from Africa to Europe has stalled at 11. That is about 189 observations short of the 100 flapping-rate sightings we were hoping to collect each field day. Such is the life of raptor biologists trying the study the flight energetic of birds of prey crossing one of the world’s great raptor-migration bottlenecks. The subjects here include both Egyptian and Griffon Vultures, and the long-term goal is to compare their flight behavior with that of Turkey and Black Vultures crossing water in the Americas. Cross winds, or winds that blow perpendicular to a bird of prey’s desired route of travel, make it energetically more expensive for a bird to stay on track while crossing the Strait of Gibraltar… and staying on track while crossing the Strait is important for migrating raptors. Simply put, the stronger the cross winds, the more costly the flight. And for the last two days, cross winds have been averaging 25 miles per hour, with gusts of 40. Expensive times for migrating raptors, indeed. And then there is the problem of wind direction. Easterly winds, known locally at “Levante,” can push tired birds to the west, and, eventually, out to sea over the Atlantic Ocean. “Out-to-sea” is not a good thing for migrating raptors. And for the past two days the winds have been Levante. Energetically expensive cross winds are one thing, energetic and dangerous cross winds are altogether something else. Ingrained in each migrating raptor’s head seems to be a rule that states “don’t fly over water in strong cross winds, and, whatever you do, don’t fly across the Strait of Gibraltar in winds that can push you west and out to sea on your return migration.” Most migrants here seem to have gotten this message, and have decided to stay put in northern Morocco until the winds die down, or at least until they change direction. Tomorrow the forecast calls for a less forceful Levante. I hope the forecast is right, as I would like to see a flight and begin recording large numbers of flapping-flight observations. This is fourth Spring that I have traveled to southern Spain to collect flapping-rate data. Initially, the study was to last three seasons. Levante winds have intervened each year. The results of the work should shed considerable light on the costs involved in crossing the Strait, where effective soaring flight seems to be difficult, particularly for large vultures. But I am still working on the results. That said, I hope to collect sufficient information this year to complete the field work, analyze the data, and publish the results. There are many other projects on my to-do list. We are here for another seven days, and I remain hopeful. My enthusiastic coworker, former Hawk Mountain Sanctuary Intern Marah Ketter remains enthusiastic as well. Tomorrow the forecast calls for less wind, and the plan is to start playing catch-up. But in the end, the answer is still “blown’ in the wind.” More in a few days. Every lion pride seems to have at least five cubs and some have closer to 10. 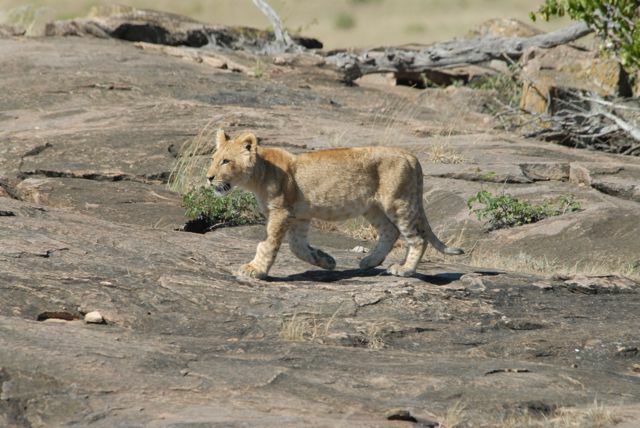 Cubs bring out the kitten in a lion with their playful antics. The cubs spend much of the day crouching behind clumps of grass so they can pounce on their siblings or being kicked by an unwilling mother as they attempt to suckle. Tourists stare in amazement as the cubs move from mother to mother trying to find a willing victim from whom they can get some attention or milk. When the pride makes a kill, the cubs find that they are not alone. As the adults lay down for a nap, the cubs chew on the remaining shoulder bone of a topi as scavengers gather. I watched as jackals tried to sneak up to the cubs only to find themselves chased by a lion only slightly bigger than themselves. Despite their small size, a lion cub could still give quite a whack and the jackals remain wary, rushing in and away as the cubs come after them. The lioness paid no attention, but for the cubs the chasing jackals, it appeared to be a fun game though they were cautious not to get too far from the pride. My fascination with arachnids continued as we sat in the grass having lunch. I noticed a small animal float before me and suddenly wiggle its way onto a grass stalk. Intrigued, I took a closer look and discovered my first Kenyan crab spider. Crab spiders are amazing. They use very little silk and instead rely on their stealth to catch insects. Usually they can be found on flowers, waiting for an unsuspecting pollinator, such as a fly or a bee, to come to the flower. Some crab spiders can even change colors to blend in with the flower of their choosing. These small spiders get their names from the way they hold the two pairs of front legs, spread wide and ever ready to give some insect prey an unwelcome hug. 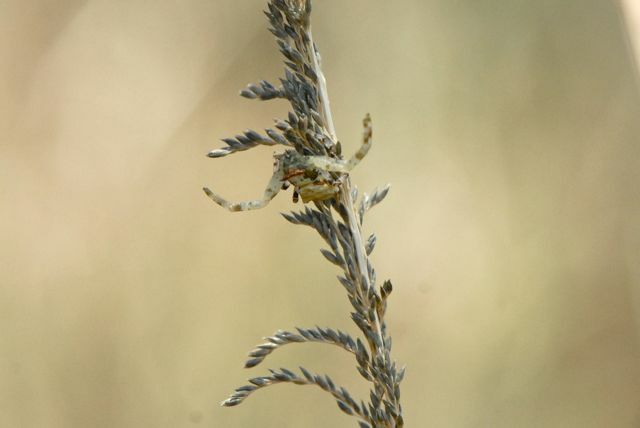 This particular spider was camouflaging so well that it took me nearly touching it for my field assistant to see it. Initially it had been climbing around the grass stalk unaware, but when it noticed the attention it was receiving it went into hiding mode. It looked just like a part of the grass stalk with its legs stretched out like tiny seeds. . It is the wet season (although we haven’t actually had any rain yet) so I wasn’t really expecting to find many carcasses – and I haven’t. But what I have found has been particularly interesting: A zebra carcass with three dogs and a handful of vultures, a hyena carcass with eight Lappet-faced vultures, two lion kills in a day (both of which got eaten by lions, not vultures), and the mutilated mass of a cow that was partially eaten by hyenas, then slaughtered for human consumption, and finally nibbled on by the birds. With all of these it has been reassuring to find that my observations and my predictions are coming closer together. 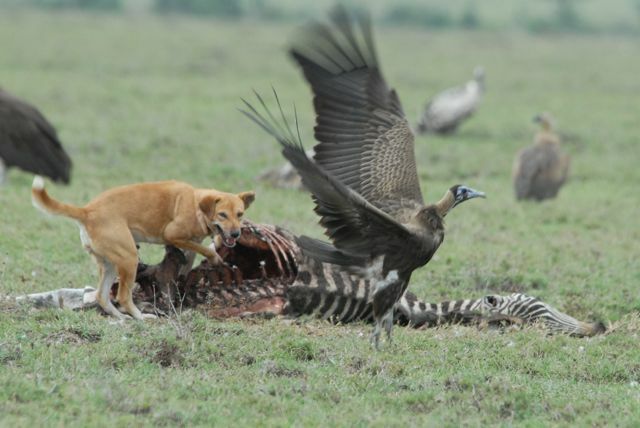 First, vultures are much more afraid of dogs than jackals, so the implications of having more dogs or dogs in certain areas are very different than more natural predators. Second, vultures will eat anything including hyenas. I have to say watching them eat the hyena did make me a little nervous as you never know how such an animal has been killed. Given the proximity to the villages, though it was in the park, I was a bit concerned the hyena could have been poisoned. But none of the vultures dropped dead and upon closer inspection once the hyena researchers arrived. As an aside, Hyena researchers gather the heads of hyenas to study the jaws, so I gave them a call when I realized what the carcass was. Yes, a bit of a conflict of interest since we had to chase the vultures off to salvage the hyena, but seemed like it was going to be more valuable data for them than me. We found that the hyena had huge claw marks around its neck and was likely killed by lions. Third, vultures get very little food from predator kills, especially this time of year when food is so valuable. A large pride of lions (with eight females and seven cubs) killed a zebra and a topi in the same day. They totally abandoned the topi so they could all work together to finish the zebra. Despite this, both animals were entirely consumed by the lions by morning, meaning that the patiently waiting Hooded Vultures got very little to eat. Finally, certain species of vultures are more likely to avoid feeding in settlement areas than others. The cow had been killed just outside the park, right next to my camp (in fact on land owned by Ilkeliani). Herders were thus passing it frequently throughout the day and actually took most of the meat for their own consumption. As a result the carcass was mainly consumed by the less shy species: Hooded vultures, Tawny eagles, and Marabou storks. A few white-backs landed but they hardly ate anything with all the disturbance and Lappet-faced vultures and even a pair of the rare White-headed vulture passed over but were unwilling to land in such uncertain territory. Interesting indeed! Otherwise the Mara has been its usual impressive self with tons of lions, a lovely leopard climbing out a tree as we bumped down a hill, and all the vultures one could hope for.